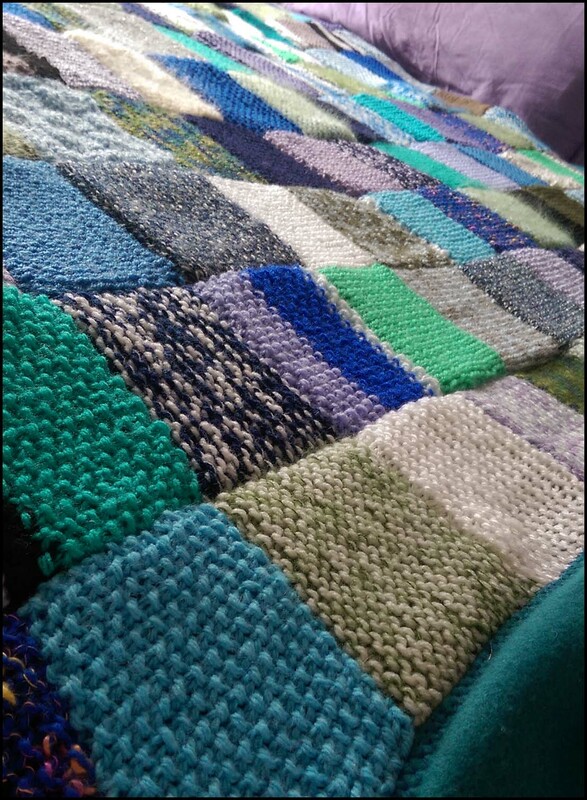 So, today is the day that I can share my joy in having finally finished my knitted emotional blanket that I began knitting some time ago. It might have been 2-3 years ago, but when I really think back, I might have started it when we moved into our current house, which is nearly FIVE years ago. The aim was to use up scraps of wool. 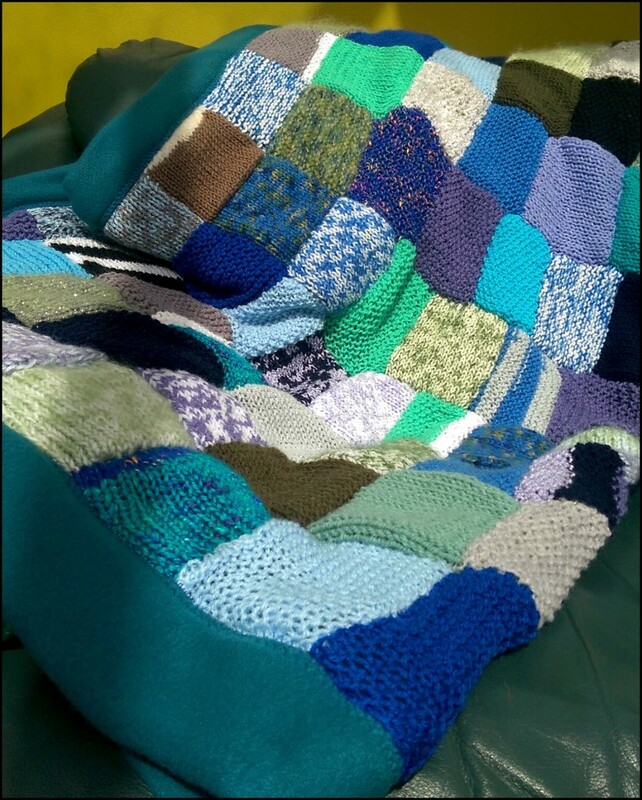 But so much more has gone into this blanket of love and emotion. And I think there have been at least 100 emotions experienced while undertaking this project. In the end, it's far from perfect. There was a problem with running out of squares. There are various different sized squares. Some are firmer and more textured than others because I used a mix of stocking stitch, garter stitch, moss stitch and a sneaky basket stitch. I used different weights of wool. And when I went to back it (I used a lovely teal-green fleece) I didn't measure. I don't do measuring, except by eye and by instinct. Because I'm emotional not logical. "The best kind of blanket is a finished one." Exactly. Sometimes it doesn't need to be perfect, because it's made by hand, not by machine. I've used 'emotional' colours: blues, greens, greys, purples, lilac and then into navy and black; the inky depths of consciousness. It goes perfectly with my green leather reading chair as well as the calming dusky heather and grey in the bedroom. 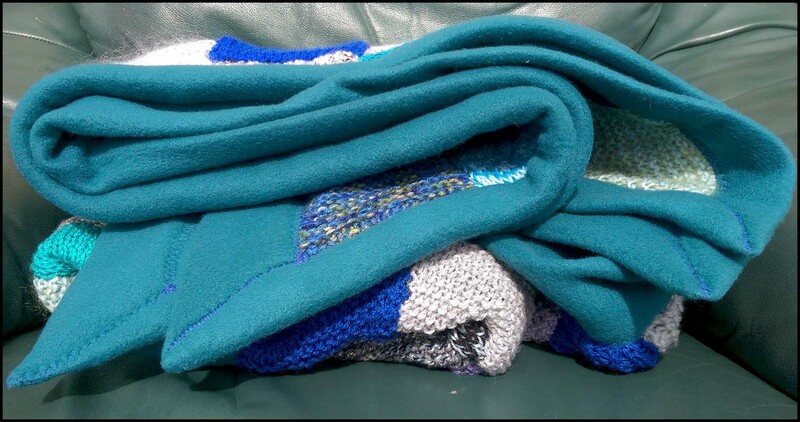 And just because it's a bit wonky in places, doesn't mean it's going to do any less of a job of providing comfort, warmth and joy on a cold winter night. Or even a cold spring/summer night. 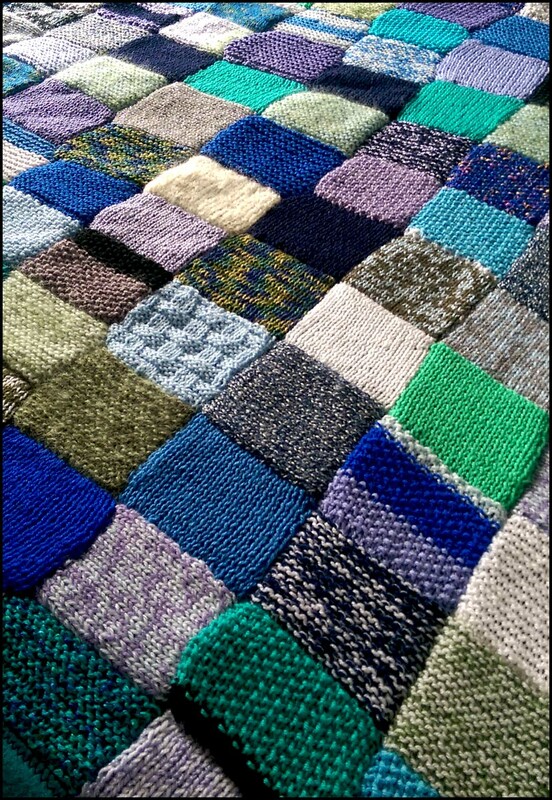 So I'm celebrating both my 100th post on this blog and the culmination of hours of work with the completion, finally, of my knitted emotional blanket. Three cheers for FINISHED not PERFECT!